It is almost time for the season! The A10 will get lots of national and local media coverage. I thought this might be a good place to put articles and videos. 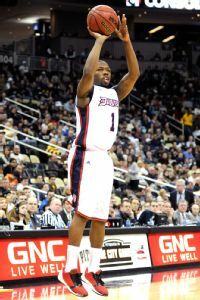 I will start with a great article about Duquesne's Derrick Colter and his fight with cancer. Derrick Colter didn't want to publicize his fight against cancer. But now, he sees that his fight can help others. 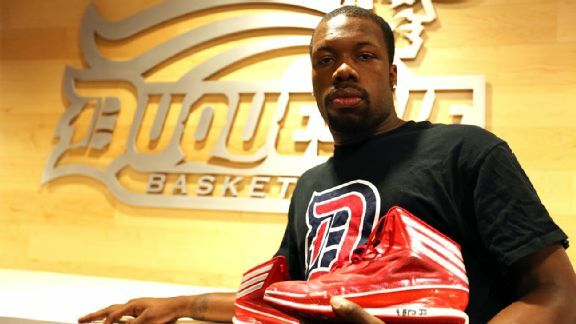 As he lay facedown while doctors zapped radiation at the back of his neck, killing the cancer that had taken root there, Duquesne's Derrick Colter never flinched. He didn't cry, didn't complain. He acted, his coach joked, as though he was trying to get rid of a pimple, not non-Hodgkins lymphoma. Colter was so unemotional that Jim Ferry struggled to find the proper word to describe his junior guard. "It was very professional, almost business-like,'' Ferry said. A lot of thoughts went through Colter's head during those 20 consecutive weekday visits to Shadyside Hospital in Pittsburgh. He worried a lot about his basketball future. Doctors told him he could do whatever he felt he could handle, and so Colter, who averaged 9 points and 3.4 assists for the Dukes last season, pushed himself. But there were days when all he wanted to do was sleep. What if that never changed? He thought about his parents. They were home in Forestville, Maryland, four hours away. Colter and his family had decided it would be best if he stayed in Pittsburgh for treatments and so he could continue seeing Dr. Stanley Mark, the physician who had first diagnosed him. But Angela and James Colter were obviously concerned and their son knew they'd want instant updates. Mostly he thought about his oldest brother, JJ, the child who never spoke a word or walked a step, but was the epicenter of the Colter family; the man who wasn't supposed to even see his teen years yet lived until the age of 33; his baby brother's role model, who fought cerebral palsy with dignity, determination, and somehow even joy, until he died in 2012. For years, James and Angela Colter shuttled between the Hyattsville, Maryland, nursing home where JJ was being cared for and their own home, where Derrick and his two other older brothers were growing up. JJ's battle included its share of life-threatening scares, yet instead of fracturing the family under the weight of its stress, JJ's condition somehow buoyed them. Derrick Colter continued working out, even as he dealt with cancer and went through treatments. A lot of that came from JJ. He smiled easily and laughed joyfully, forging a bond with his brothers built on intuitive, not verbal, communication. Muscle degeneration made it impossible for JJ to use his hands, but Derrick, the baby of the family who idolized JJ, found a way to toss a basketball with him, anyway. When the Colters needed outside support, they turned to their church. As part of its Sunday services, the True Way Holiness Church congregation gathers for the Victory March, an uplifting parade around the church. Contrary to what the name might imply, it is not meant to celebrate accomplishments, but rather to ask for help in the gravest of circumstances. The congregants have marched for a church member whose baby had stopped breathing, and for another who had Hepatitis B. They marched in April for Derrick, and before him, for JJ. The Victory, James explained, is having the faith to ask for help. For so many years, JJ defied the odds, so long in fact that no one ever thought the disease would win. In 2012, during Derrick's freshman year, his parents called Ferry to warn him that JJ had taken a turn. Then, one day, Derrick didn't show up for practice. "I remember it was a rainy day and [Derrick] came walking into practice, just distraught,'' Ferry said. He went home for the funeral with instructions to take as much time as he needed. Instead, on the same day that he buried his brother, Colter was on the court, playing against Robert Morris. He scored 16 points to go with six assists. He first felt the lump in March. It was small, maybe the size of a tiny super ball. Derrick mentioned it in passing to his athletic trainer, Vic Bauer, while Bauer was taping his ankles before a game at George Mason. He said it had been there for three weeks. Bauer took a look and, not wanting to upset Derrick, sent him out for pregame warm-ups. Then he got on his phone. Three days later, team physicians looked at the lump in Brooklyn, New York, during the Atlantic 10 tournament. After Duquesne was eliminated, they all consulted with Marks, the deputy director of clinical services for UPMC and the University of Pittsburgh Cancer Institute. Marks ordered a biopsy and, on April 22, while Derrick was home for Easter weekend, Dr. Marks called with the diagnosis. Derrick had non-Hodgkins lymphoma, a cancer that attacks the lymphatic system. That was the beginning and the end of the Colter Family Pity Party. After PET and CT scans showed no other malignancies in his body, Derrick began his radiation treatments on May 1. Ferry often went with him. Before coming to Duquesne, Ferry was the head coach at Long Island University. Four years ago, his best player, Julian Boyd, was diagnosed with a heart condition and was forced to sit out a year. Player and coach had more than one serious conversation as Boyd tried to navigate the emotional roller coaster of his diagnosis. That's what Ferry was prepared for with Derrick. He even offered him a spare bedroom in his home, so Derrick could relax in peace after his radiation treatments. Derrick opted for the dorms. "It was never once a 'why me' situation,'' Ferry said. "His first question in the doctor's office was, 'When can I work out?' I was, I am, amazed." It was that commitment that first appealed to Ferry. In high school, Derrick was a high-scoring point guard who led his team to a Maryland 2A state championship game. Ferry knew he'd be a critical addition as he rebuilt the Dukes without T.J. McConnell, who had decided to transfer to Arizona. After three years of coaching Derrick, it's his attitude that Ferry finds even more impressive than his ability. The spotlight has never mattered much to Derrick. Amid the fanfare at his high school when he signed his letter of intent, Derrick said he'd rather be off visiting JJ. 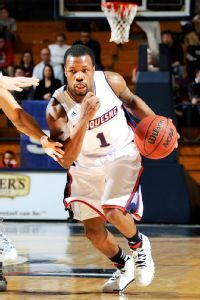 Derrick Colter averaged 9.1 points per game a season ago for the Dukes. For the better part of this summer, in fact, hardly anyone outside of his family and his basketball family knew Derrick was battling cancer. He's telling his story now for the first time only after some cajoling, and only because he sees a bigger purpose. At the end of this month, he'll be feted at a Coaches vs. Cancer benefit in Pittsburgh. But before that, he plans to visit the pediatric cancer wings at Pittsburgh area hospitals. He wants the kids to know that he was just like them, exhausted from the treatments. Maybe he'll even show them where he's lost a bit of his hair. And he wants them to know how he played basketball this summer and recorded a triple-double in a Pittsburgh Pro-Am League game (33 points, 10 rebounds and 13 assists); how he will be ready to play when the Dukes open the season in November, just seven months after his diagnosis. He wants them to know about JJ, too, and how tough he was, tougher than any basketball player Derrick knows. Mostly he wants to tell them about June 24, the day doctors told Derrick that his cancer was in remission. Mulder, bprichard and vcurams05 like this. Last edited by AlienAiden; 09-09-2014 at 08:34 AM. Jones barely saw the court as a freshman until February, when the Spiders' starting point guard, senior Cedrick Lindsay, went down with torn meniscus in both knees. Jones entered the rotation -- and took shots at nearly the same rate and efficiency level as Lindsay, who had been averaging 18.3 points per game. Kendall Anthony, a similarly undersized (at 5-8) and scoring-minded (26.7% of the team's possessions) combo guard, is a near-lock to be their leading scorer this season, but Jones could emerge as the No. 2. He's an even more accurate three-point (38.2%) and free-throw (87.8%) shooter than Anthony, and he seems to be the latest in Chris Mooney's line of underrated guard prospects at Richmond. ur2k and paulxu like this. AlienAiden, thanks for posting the story on Derrick Colter. Wishing the best for Derrick. And he is really a nice, down-to-earth young man; he was easy to root for even before this story broke. At halftime of the CRONS-Bakery Square matchup Monday, our intern Hayes Gardner, a bench-warming staple of the Grinnell College men's basketball team, pointed toward CRONS No. 31 and asked, “Who’s that? He’s been easily the best player on the court.” Indeed, Colter looked great. That’s no huge surprise, really; we know he’ll bring the speed and can flash a scorer’s touch. What too often landed him on the bench last season was his affinity for turnovers and his inability to slow scorers on the other end of the court. He rarely showed the ability to create his own shots, which led to some lopsided shooting performances. In the first game this summer, he shot 5-of-17 from the floor for 15 points. This Monday he was 9-of-21 for 23 points. He had a chance to tie the ballgame at the buzzer but his 3-point floater, a la St. Bonaventure, didn't fall. Colter’s 3-pointer seems to be progressing, too. He shot 31.4 percent as a freshman and 34.5 percent as a sophomore. I saw him pull up and swish three long jumpers Monday and look very comfortable doing so. If he can be counted on as a reliable deep threat — not necessary on Micah Mason level, but somewhat reliable — it would help spread the floor. Colter also showed increased willingness to drive to the basket despite giving up a foot on the bigs. Watching these games, you’ll notice immediately that when Duquesne guards, particularly Colter and Ridenour, are handling the ball, games run at an absolute breakneck pace. Not sure how the Pitt/West Virginia/Robert Morris teammates love playing the up-tempo transition game, but Jim Ferry, looking on from the third row of bleachers, certainly likes to see things hum. In his third season as starter on the Bluff, I’d expect Colter to be fully ready to push the pace and keep a handle on the transition game. So far, so good. Rothstein is at SJU so I know Hawks fans are excited about that. Ha! Palpable buzz at Hagan Arena surrounding Saint Joseph's freshman SG James Demery. Hawks' staff is expecting a "DeAndre Bembry" type impact. Aside from a lack of experience, the biggest concern from an early look at St. Joe's is outside shooting. Hawks lack reliable shot makers. West Virginia transfer Aaron Brown will give St. Joe's a different look as an undersized PF. 6-6 and strong. Will "trail" on the break. St. Joe's red shirt freshman Jai Williams is down to 265 pounds. Was originally 300. 6-9. Will split time at center with Javon Baumann. So far he's spot on. Williams and Baumann are total space eaters. If they can learn more of the game, they'll be capable Drexel-like bigs off the bench. I'd go broke since he usually eats like three at a time. Bill Russell and AlienAiden like this. What is Rothstein's hype to success ratio? He has hyped a few Fordham players through the years, so that can't help it. Bill Russell and sjhawk13 like this. Depends what your asking. Sometimes he a little to optimistic about certain players but usually isn't too far off. He actually surprisingly not too far off when he is talking about teams in general. His predictions for the leagues standings, sleepers and recruiting are pretty decent. However, he is a total goober when it comes to his twitter. @Phil MartelliSJU on the Atlantic 10 "The depth of the league doesn't change. 2-11 could be ranked one way today + another way on Thursday." @Phil MartelliSJU on VCU "They're going to have a number next to their name all season along. That's a legitimate Top 15-20 team." @Phil MartelliSJU on Chris Wilson "We need him to run the team. He doesn't have to score more, he just has to run the team." @Phil MartelliSJU on James Demery "He came here because he knew immediately he'd have a big piece of the pie." @Phil MartelliSJU on DeAndre Bembry "We're counting on him to be an all-league caliber player and I think he's going to relish that." I know who does not overhype and that is my main man Coach Phil Martelli!! [email protected] on VCU "They're going to have a number next to their name all season along. That's a legitimate Top 15-20 team." Well, we were smaller, but at least we were slower! Will "trail" on the break. Actually I think he is undervaluing VCU. He should have said Top 10-15. What are you talking about? I only remember 2011. Is VCU in a new conference? Ranking anything these days guarantees a debate. The discussions had in the wake of a new top 25 poll or All American finalist list are always filled with passion. In that light, we decided to create four different top five lists in areas that are always hot topics in college hoops: best players, coaches, arenas and fan-bases in the Atlantic 10. First up, top 5 players in the Atlantic 10. Let the debates begin! First team All Atlantic 10 last year, the 6-foot-6 senior averaged 15.8 points and seven boards while chipping in a pair of assists per game to boot. While you could go with a few different players in this spot, Graham is the best player on the best team in the league which gives him my nod for preseason Player of the Year. Graham returns as not only VCU’s senior leader, but also one of the top seniors in the country. The versatile wing will try to cap his career at VCU with a deep trip into March. Anthony seems to have largely flown under the radar in basketball circles. He has averaged at least 11.5 points over three seasons and broke out even more so last year by finishing seventh in the league in scoring at 15.9 points. The only knock on KA 2.0 is that he is purely a scorer and doesn't generally doesn't do anything else exceptionally well. Still, there's a lot of value in a guy who can score in bunches and catch fire from deep. With Richmond set to be improved this year, we will likely hear more about Anthony in his final go-round. Those shocked to see Matthews this high on the list probably didn’t see him play after the calendar turned to 2014. The rising sophomore grew leaps and bounds and averaged 14.3 points and 4.3 boards, averaging 19 points in URI’s final dozen games. This summer, Matthews was invited to the prestigious Adidas Nations Camp and turned heads. The Rhode Island guard is the best professional prospect in the league right now and could be a three-year player at URI. We're expecting big things from the lean lefty. Formerly making our lists as the top player in Philly, Bembry is now a top five player in the A10. A Co-Rookie of the Year with Matthews, the 6-foot-6 wing is a complete player who is just scratching the surface of his potential. Though the box score can afford him praise, Bembry's best work may come on the defensive end where he is an absolute shutdown defender against multiple positions. Expect his stat line from last year (12.1 points, 4.5 rebounds and 2.7 assists) to beef up as he becomes the Hawks' go-to player in year two. One of the best college perimeter defenders of all time, Weber turned himself into a solid offensive point guard in his junior season (9.4 points, 3.9 assists). Weber not only led the nation in steals last year at 3.46 per game, he basically lapped the field. His 296 career steals give him a shot at breaking the NCAA career record. He and Graham give the Rams two terrific seniors, the value of which cannot be understated. Weber's ability to defend on the ball and jump passing lanes qualify him as a top five player but his potential to develop into a credible offensive player make him all the more valuable. Something's not Wright here. As in Jerrell. The La Salle big man finished last season with averages of 13.3 ppg and 6.6 rpg and was ranked in the conference's top 10 in several categories, including offensive rebounding (4th) and field goal percentage (4th, 57.6 percent). Penalized by his team's lack of success, Wright has been off the accolade radar but is arguably the best big man in the Atlantic 10. He's a beast on the glass and creates great separation by initiating contact and using an effective jump hook in the pivot. Team success - whether unfair or not - often drives all-conference discussion... but I'd have Wright on here as the 6-8 forward heads into his senior year. GW's Patricio Garino was the one of only three non-seniors (joining Anthony and Graham last year) to make an all-conference team, 3rd, a year ago -- but doesn't appear here. While steady, I don't think Garino's performance in 2013-14 merited all-conference status, but it's worth noting that Ian left him off his top five list. He misses mine as well. GW's Kethan Savage is another to watch, while an eye also needs to be kept on the Dayton duo of Dyshawn Pierre and Jordan Sibert. As for these five selections, the versatile, 6-6 Graham is a consistent producer night-in and night-out, scoring in double figures in all but three games last season. Anthony is a tough and fiery scorer, though Matthews and Bembry would be higher on my list. Matthews is a special talent and best NBA prospect in the league. Bembry is the most well-rounded on both sides of the ball. And Weber is an incredibly rare blend of energy, length and lateral quickness that gives him an ability to impact a game defensively like nobody else in the nation. But if I had to swap Wright with one of Ian's choices, it would be for Anthony based on the expected jump I anticipate Bembry and Matthews taking.